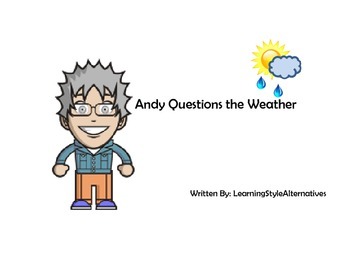 “Andy Questions the Weather” is an interactive book specially created to use with a Augmentative Communication Device (AAC). 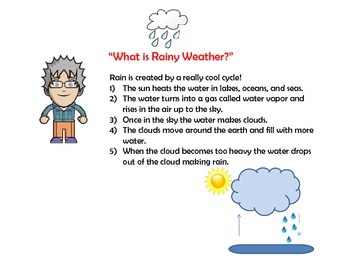 Useful for science activities, the student and teacher take turns reading. 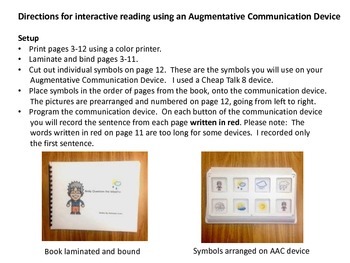 The student matches a symbol from his AAC device to read the sentence written in red. The teacher reads the portion written in black. This lesson can be used to collect data on matching objectives. Note: I used a Cheap Talk 8 when designing this lesson. However, it can be adapted to more simplified AAC devices, or turned into a picture matching activity. This modification is made easy by using Velcro to match the symbols directly to the page instead of using a speech device. If you find this book helpful, please take a moment to leave feedback.